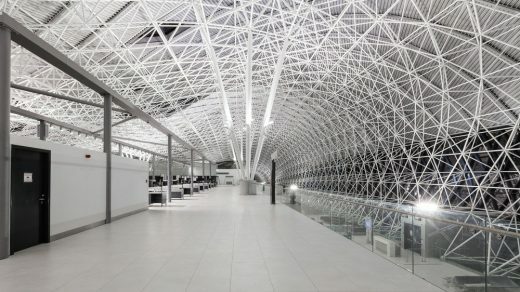 Architects: Kincl d.o.o., Neidhardt arhitekti d.o.o., IGH Projektiranje d.o.o. 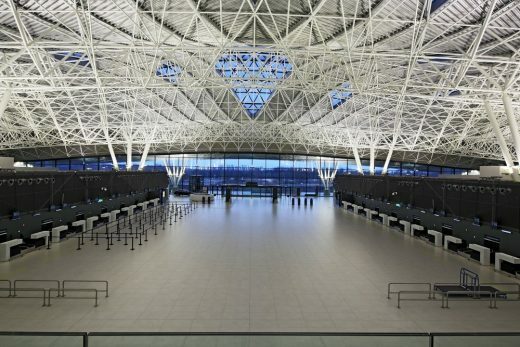 In 2008, an international architectural design competition was held to select the best project for the New Passenger Terminal at Franjo Tuđman International Airport Zagreb. In order to ensure architectural excellence, an international competition jury invited ten world-renowned architects together with ten acknowledged Croatian architects to participate, ultimately awarding first prize and commission to the entry designed by Croatian authors-architects Branko Kincl, Velimir Neidhardt and Jure Radić. 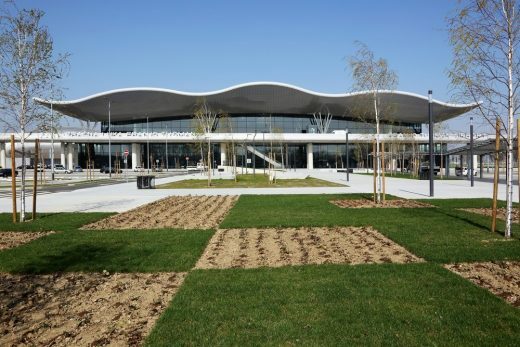 The French concessionaire started building in 2013 executing the design delivered by authors-architects and design companies IGH Projektiranje d.o.o., Kincl d.o.o., Neidhardt arhitekti d.o.o. 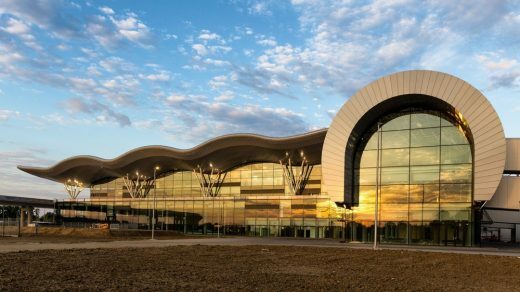 The new terminal complex opened in March 2017 as the 1st phase construction of 65,000 m2 serves up to 5 million passengers a year. 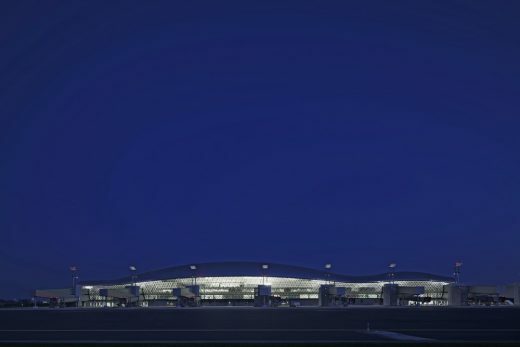 The first phase site plan has 8 boarding bridges linked to the terminal building on the north side, and an arrival/departure ramp with a viaduct on the south. 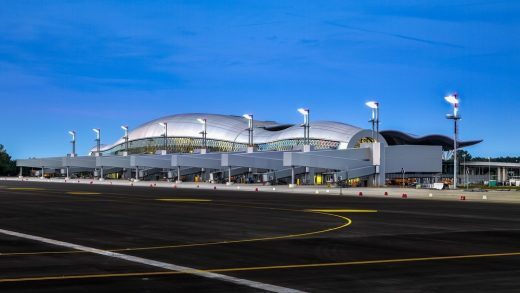 The viaduct is built to accommodate the extension of the terminal building to the east, when the airport capacity increases over 5 million passengers, and in addition to east and west with both piers extensions to 10, 12 and 15 boarding bridges in several phases according to the number of passengers. At the end of 30-year concession 2nd phase additions will serve 8 million passengers. The landside surroundings spatial organization at the entrance allows the dominance of pedestrian esplanade in the middle. The traffic functions between two traffic roundabouts which serve as connecting points to viaduct ramps leading to or from the departure level curb at 10.20 m above the ground. Internal roads and arrival/departure ramps are flanking the central pedestrian surface. A passenger car park is situated on the east, and on the west there is an employee’s parking, bus and taxi stops and a rent-a-car amenities including their parking. Main public levels at landside of the terminal—the ground and upper departure level—are connected by outdoor escalators and elevators and by interior sets of elevators and stairs within circulation cores. 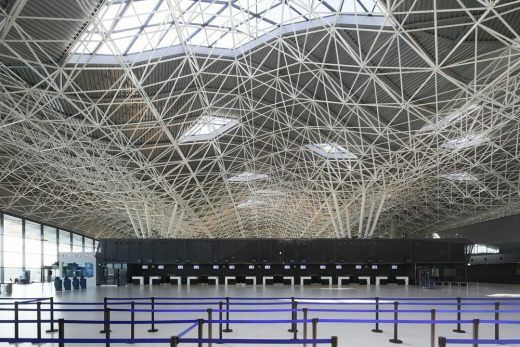 Three levels of reinforced concrete structure form the terminal’s base. 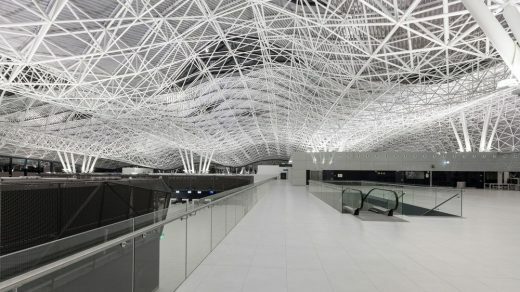 A dynamic roof envelope, which unwraps itself, to levitate above the terminal hall generates the free dynamics of the structural net—an iconic expression of the landscape and its relief features as original attributions to the generated architectural form. The distinctiveness of the architectural design is achieved through a composition of hypars. 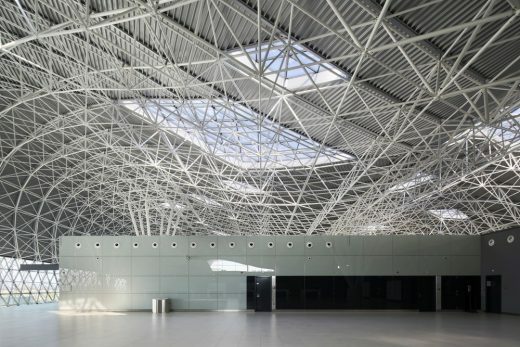 The envelope structure is a spatial truss gently curved in two directions deploying tens of thousands prefabricated steel tubes and nodes based on the triangular off grid module ending in bright, glossy and clean roof surfaces. 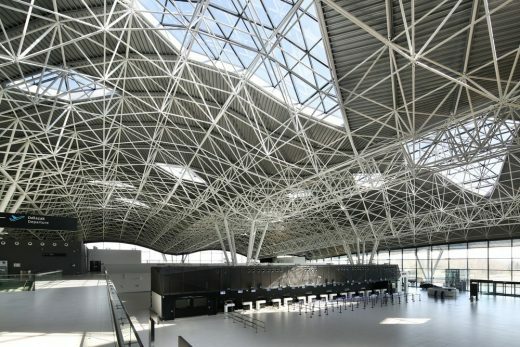 In the same way, the interior is enriched with the originality of the curved ceiling and construction that is bursting with a multitude of steel elements of the spatial steel structure. 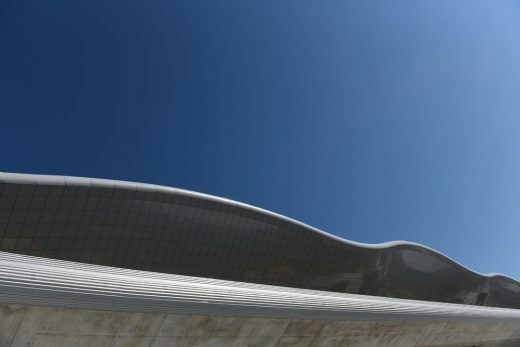 Such a computer-generated harmony leads the engineering interpretation towards the top of the architectural concept materialization. 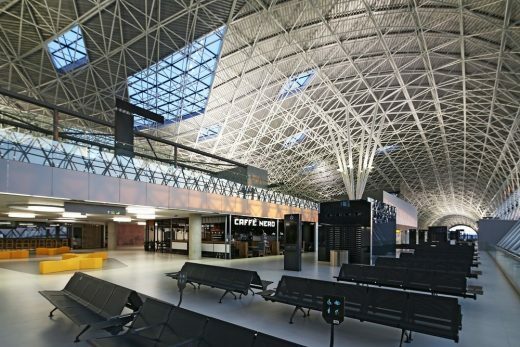 The terminal building interior ambience bears the attributes of neat, clearly arranged areas that follow the functional requirements of airport protocols. Well-lit spaces with natural and artificial diffused illumination are distinguished with great functionality based on a clear organization of short connections—paths. 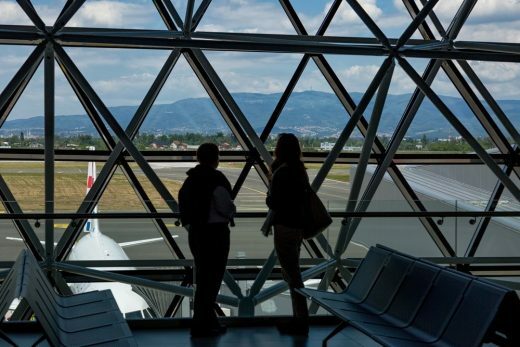 Large glass facade surfaces give the passengers the chance to enjoy the landscape while moving through the terminal building. 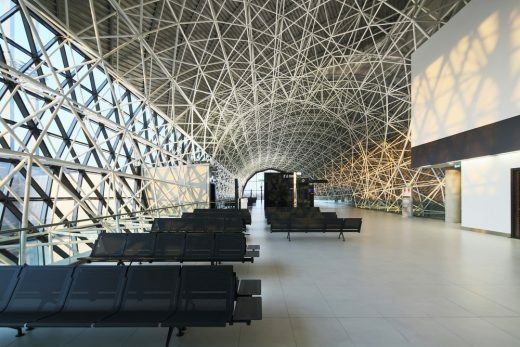 The perception of interior and exterior spaciousness contributes the sense of comfort while staying in the terminal building and makes the journey more appealing. Flexibility of conceptual scheme allows for adaptability with open spaces formed by predominantly 14.40 x 14.40 m modular column grid at the concrete base. Post-stressed reinforced concrete structure is built on a grid pattern with various spans that are multipliers of the base module: 7.20 m, 14.40 m, etc. 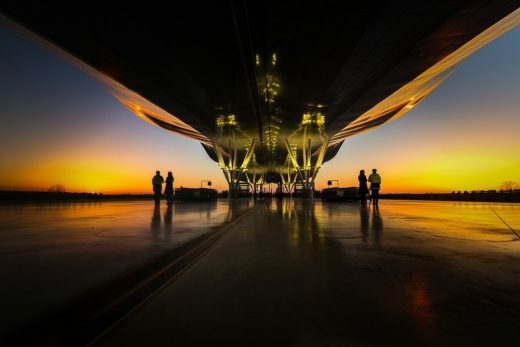 The pier design allows for flexibility that is necessary to sustain the expected increase of air traffic in the future. 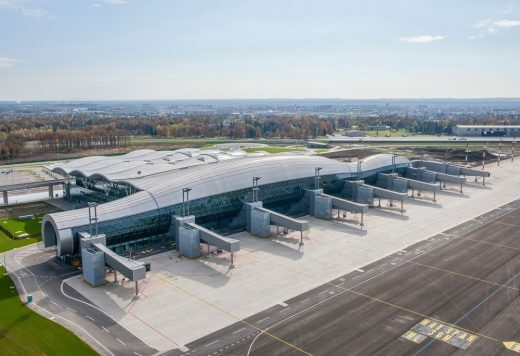 New Passenger Terminal building dimensions are 153 m by 153 m, reaching to a height up to 35 m, with a 284 m long pier, total gross building area of 65,000 m2. Leaving the check-in area passengers reach the boarding ticket control counter and subsequently are invited to ascend to the Departure gallery at the 3rd floor level. 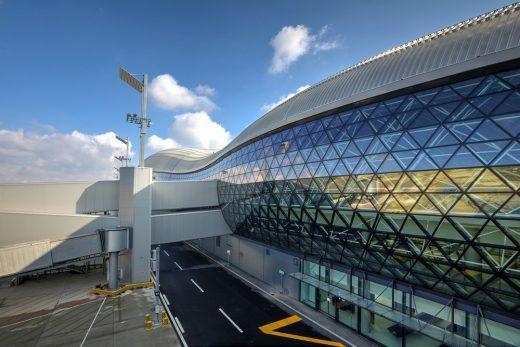 Upon security check and passports control, passengers descend to duty-free/commercial amenities shops, bars, restaurants, waiting areas and a CIP lounge, located before the reach of air bridges gates at the departure hall level. The NPT building could sustain a major crisis possibly caused by a failure of all standard energy supply sources. All other procedures support an ecologically sustainable concept of the completed design. Design Companies: Kincl d.o.o., Neidhardt arhitekti d.o.o., IGH Projektiranje d.o.o. Academician Branko Kincl, architect and full professor at the Faculty of Architecture, University of Zagreb, professor emeritus, designer, constructor and urbanist, was born in 1938 in Zagreb. Even at the very beginning of his career, shortly after graduating from the University of Zagreb, Faculty of Architecture in 1964, his main subjects of focus have been recognized and highlighted, and became his signature works. He pursues his interest in a wide range of topics, from general master plans and detailed urban plans of Zagreb and Osijek, to smaller scale town-planning projects and preliminary arch. design, sports architecture, public, office and residential buildings/complexes/interpolations in the context of cultural heritage preservation, individual residential housing, health architecture, conservation and reinterpretation of industrial architecture, traffic planning and design, preliminary urban/architectural design studies and visualizations, new digital technology applications, etc. After receiving his degree, he obtained further architectural training from renowned professor Drago Galić in his workshop in 1966–1968. He worked at the Urban Planning Institute of the City of Zagreb, the Urban Planning Institute of the former Socialist Republic of Croatia as well as at the Zagreb University’s Faculty of Architecture Institute of Architecture as an independent designer, and later became lecturer, associate professor, subsequently receiving permanent tenure as full professor. Professor Kincl was for a number of years head of the study centre at the Summer School of Architecture in Motovun, and in 2006 he was confirmed as a full member of the Croatian Academy of Arts and Sciences. Branko Kincl is the author of more than 250 architectural studies and projects, around 40 residential, public and sports completed buildings as well as interiors. He participated in a series of competitions, and has been awarded numerable times. He exhibited his work in more than forty solo and group exhibitions and has won numerous awards, most recent being the “Vladimir Nazor” Life Achievement. Academician Velimir Neidhardt was born in Zagreb, 7 October 1943. He earned his B.Sc. in Architecture and M.C.P. at the University of Zagreb. He spent one academic year, 1974-75, at Harvard University and, partly, M.I.T. as the Zlatko and Joyce Balokovic Scholar. This was followed by an invitation to work in the Skidmore, Owings and Merrill Architectural Design Studios in Chicago 1975-76. He was elected Fellow (Academician) of the Croatian Academy of Arts and Sciences in 1991. 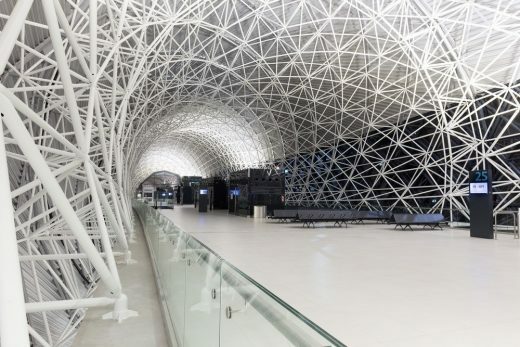 For his works, he has been awarded many prizes such as the Vladimir Nazor Award for excellence in architecture for the years 1989 and 1995, the Viktor Kovacic Award for excellence in architecture for the year 1979, City of Zagreb Award in the year 2002. 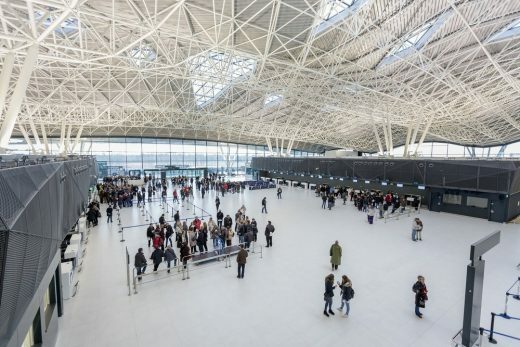 His major competition first prizes have been executed, such as the National and University Library Building in Zagreb, the City Centre I of Banja Luka in Bosnia and Herzegovina, the INA Petroleum Co. Office Building and New Passenger airport terminal in Zagreb. His book dealing with the anthroposocial method of design entitled Man in the Environment (Covjek u prostoru) was published in 1997. He is a long-standing member and President (1995-99) of the Croatian Architects Association and an International Associate of the American Institute of Architects. He earned his Ph.D. in 1990 from the Faculty of Architecture, Zagreb University. In 1994, he joined the full-time faculty staff and in 2004 earned the tenure as Professor of Architecture, with courses on Office and Commercial Buildings. As Professor Emeritus in 2015, he released his course lectures on You Tube. Neidhardt has established his own architectural design firm NEIDHARDT arhitekti d.o.o. Zagreb and since 1996 has continued both practicing and teaching architecture, now at doctoral level. In 2011 he has been elected to the position of Vice—President of the Croatian Academy of Arts and Sciences, and in 2015 has earned the Corresponding Membership of the Slovenian Academy of Arts and Sciences. A family company Kincl d.o.o. was established in 1998 and has had a series of successful projects since, realized for prominent clients—investors from Croatia and abroad. The company deals with design work, supervision and consulting in the high-rise construction and town planning projects, and tourist activities of leasing vessels. “KINCL” Ltd. is a logical continuation of the work of academician Branko Kincl and his associates in the new market economy environment. The company permanently employs several other architects, a PR consultant and director Nikola Kincl. They all form a team, together with academician Kincl, who all, with outsourced associates and companies in constant long cooperation and partnership, represent a quality guarantee for making all kinds of high-rise construction designs, town planning and spatial plans. The business policy is based on partnership with clients and providing services of the top authorial and engineering quality, as well as an individual “non-standard” approach to every task, guaranteeing top quality of the final product to the client—partner, at mutual satisfaction and prosperity of both sides. Neidhardt arhitekti d.o.o. has been established in 1996 by its principal academician Velimir Neidhardt, architect and heir of the famous Croatian architectural family. It is a modern shamrock working environment organization consisting of a core of professionals, part-time associates and apprenticing students, which according to contracted tasks pulsates in size. At large scale tasks, Neidhardt arhitekti d.o.o. has performed as a general design contractor and has been leading the assembled teams close up to 100 professionals. Among others, projects are INA Croatian Petroleum office Zagreb Headquarters – 1989, Croatian National and University Library—Zagreb 1998, Croatia Insurance Zagreb Office Headquarters – 2005, Library of the Croatian Academy of Sciences and Arts—2008, and recently Zagreb Airport New Passenger Terminal Building—2008–2016 with Kincl d.o.o. and IGH Projektiranje.